The script checks for a number of parameters like, registry keys and running services for Hyper-V, VMWare, Virtual PC, Virtual Box, Xen and QEMU. 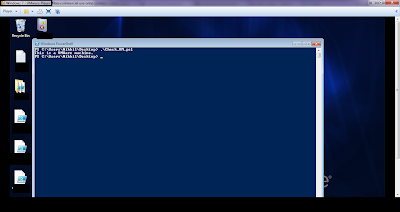 A code snippet showing the logic for detection of Hyper-V.
"This is a Hyper-V machine." This is how it looks like when ran inside a Windows 7 on VMWare. UPDATE: Thomas hac confirmed that the script detected a Hyper-V machine. The script has been added to Nishang repo, please update your repo to get the script. Hope this would be useful. Comments and suggestions are welcome. 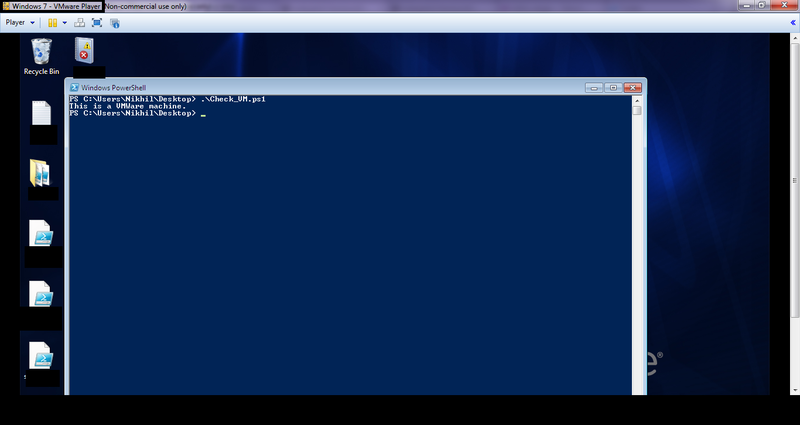 This correctly identifies a Hyper-V VM running under Windows 8. Thanks Thomas, I have updated the post. That's cute. Makes me wonder if a non-VM machine, with suitable reg keys or drivers loaded, could fool malware into thinking it's in a sandbox and aborting. That would be possible in this case. This script depends entirely on Registry keys and names of processes to detect VM. Hi Successfully detected a windows 2012 server running on vkvm/Qemu. Navigation on a touch screen is very tedious, it keeps taking me to next/prev page when I scroll or zoom, plz fix as I am quite enjoying your research good sir.